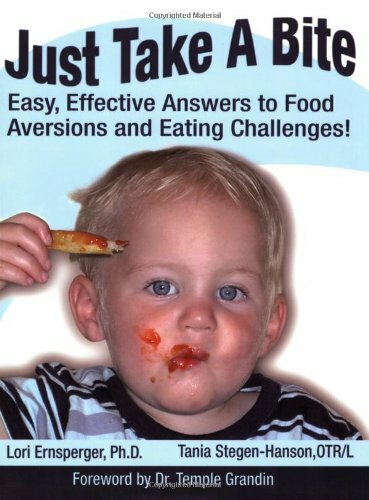 Item Nr: B 95640 Title: Just Take a Bite: Easy, Effective Answers to Food Aversions and Eating Challenges! Discusses the possible causes of food aversions, when to seek professional help, and how to deal with the behavior at home. Chapters include: 1.Who Are Resistant eaters? 2.Oral-Motor Development 3.Environmental and Behavioral Factors Contributing to Problems with Eating 4.Sensory-Based and Motor-Based Problems Affecting the Resistant Eater 5.Motor-Based Eating Problems vs. Sensory-Based Eating Problems 6.Designing and Implementing a Comprehensive Treatment Plan 7.Environmental Controls 8.Gastrointestinal, Physical and Oral-Motor Development 9.Stages of Sensory Development for Eating 10.A Recipe for Success.